Imagine. Imagine, 100 million people meditating at the same time. What does that look like? How does it feel? What change would it bring to the world? 1 Giant Mind’s mission as a non profit organization is to get the whole world meditating and connecting as one, one step at a time. The project was founded on the education and dedication to ‘Eyes Closed Silence’ (ECS), a mental process of meditation, prayer, contemplation or observance of the breath. All people of all religions can enjoy these common practices and cultures that induce a set of psychophysiological changes termed as the ‘relaxation response’. The ‘relaxation response’ includes changes in metabolism, heart rate, respiration, blood pressure and brain chemistry. All are factors concluded and conducted by independent scientific studies from modern leading scientist of the world. “Stress is at the root of all the dysfunction in our minds and bodies. Remove stress and we have a real opportunity to flourish”, says Jonni Pollard co-founder of the 1 Giant Mind project. He adds, “By regularly resting and repairing, we are eliminating that very thing that negates the flow of our awareness, we increase our ability to adapt to the challenges and demands life throws at us with greater ease and grace, we are more empathetic and our experience of ourselves becomes exponentially more authentic. This naturally and automatically happens when we remove the pressure of stress from our systems”. Research is growing rapidly within the neurological world into the affects on brain change through meditation. Instruments and techniques such as EEG (Electro-encephalography) and FMRI (Functional magnetic resonance imaging) are being used to show what happens to people when they meditate, both short-term and long-term. Meditation techniques train your brain, just like it would if you were to learn something new, like an instrument for example. The studies have shown a deeper connection to compassion and understanding of others, mindfulness, higher concentration. A study taken in 1993, from Washington D.C, saw 400 meditators inside an airport hanger over an eight week period. The scientific hypothesis from ‘The National Demonstration Project’ was to show that the meditating group would cause a 25% reduction in violent crime in the entire DC area. The police commission considered that a “1% reduction in crime would be a miracle”. The end result possibly was a “miracle” for some; a 24.5% reduction in crime over the 8-week period was reported. The study reveled that a 1 billion in 1 chance that this reduction increase was to do with anything else. As soon as the project stopped, the crime rate went back up. Schools and universities across the world have concluded that meditation techniques have improved students’ level of concentration and their overall results. Filmmaker and artist David Lynch leads a foundation of consciousness-based education which works with at-risk populations such as underserved inner-city students; with veterans suffering from PTSD; American Native Indians suffering from diabetes, cardiovascular disease, and high suicide rates; homeless men who are striving to overcome addictions; and imprisoned juveniles and adults. The effectiveness of the programs run buy the foundation have been researched by world leading universities, including Harvard medical school, Yale and Stanford medical schools all of which conclude that meditation techniques help brain growth and functioning along with physiological changes, such as a reduction in anxiety. 1 Giant Mind conducts its research and education by an inclusive participation. The project invites everybody not just meditators from a particular tradition or practice. It lives by an organic evolution by not promising to bring about world peace, but to educate & inform humans and conduct sophisticated scientific research to understanding its participants. “We have no absolute defined outcomes other than to enhance the human experience. It’s an innocent exploration that can involve everyone no matter where you come from”, states Jonni Pollard about how the project differs from other similar organizations. Events, or experiments as they are known, are held across major destinations across the world, including New York, Los Angeles, Sydney and Bali. The awareness is spreading globally. Eyes closed silences are being simultaneously coordinated to create greater awareness and expand the level of consciousness throughout communities of the world. If the experiment in Washington were just a small slice of what eyes closed silence can change in our world, what would 100 million people participating do for or failing planet? Based on the studies conducted thus far, we could see a high sliding percentage of crime rates, a more sustainable economy and less terrorism and violence in our word. The more individuals that are walking the streets less stressed, calmer, conscious and happier will result on having a knock-on affect on the persons whom they come in contact with. The dynamic team who have created this immense vision of the world’s biggest experiment of eyes closed silence, include that of international meditation teachers, Jonni Pollard and Garry Gorrow along with expert marketers and executives, all bringing their passion to this need. They have collaborated with some of the world’s leading scientists including, Dr. Paul Zak, Proff. Constaine Korotkov, Proff. Roger Neilson, to name a few. They also have an increasing advisory board of influencers. 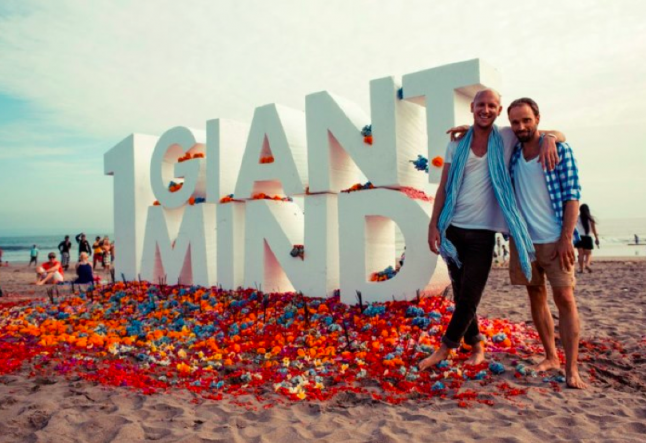 From religious leaders, political figures, prominent wellness figures and business executives, 1 Giant Mind is a firm position of great timeliness and ever increasing success. Wikipedia, David Lynch Foundation, 1 Giant Mind.